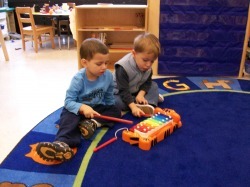 Our youngest learners are enthusiastic, active, and full of life. They love to learn through play. Our toddler classroom is full of activiities and it is a happy place where children can learn, explore, sing, and dance. Our program for toddlers is designed to encourage each child's growing need for independence and to promote the development of their self-esteem in a safe, caring manner. The creative curriculum includes social/emotional, physical,cognitive, and language development. Weekly enrichment activities to each thematic unit will build on your toddler's development and emerging interest and abilities. There is daily communication between parents and staff members. There are clearly defined and labeled learning centers to help your child understand that materials and equipment have a special place. In addition, there are ample opportunities for your child to practice self-help skills, like eating and using the bathroom.